A complete step by step tutorial on Introduction to BME280. Hello friends, I hope you all are doing great. In today’s tutorial, we are gonna have a look at detailed Introduction to BME280. 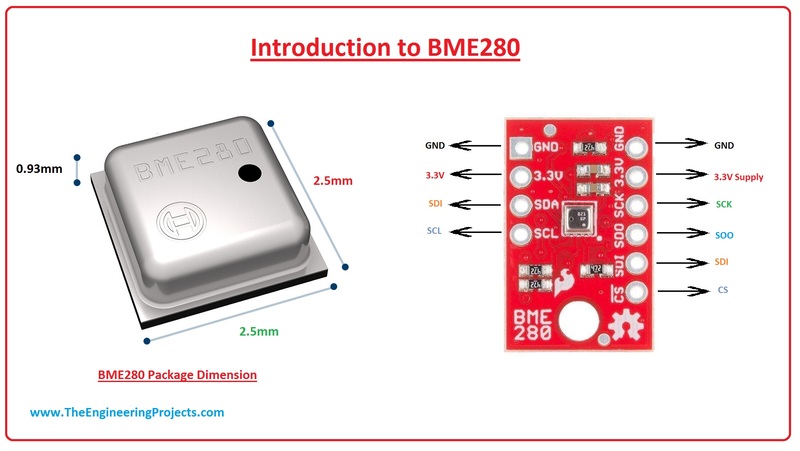 BME280 is a digital pressure, humidity and temperature sensor. This module consists of extremely compact metal-lid LGA packages. Its low power consumption and small dimensions allow its implementation in battery-driven devices such as GPS, mobiles, and smartwatches. It’s working protocol is I2C and SPI, it is designed for both protocol, it has a separate pinout for I2C and SPI. BME280 is used in different industrial projects and electronic devices such as GPS, handsets, and watches. It provides high performance in all applications requiring humidity and pressure measurement. In today’s post, we will have a look at its working principle, feature, specifications, applications, pinout, etc. I will also share some links where I have interfaced it with other microcontrollers. If you have to know further information about it please ask in comments, I will provide some advanced knowledge about it. So let’s get started with introduction to Introduction to BME280. BME280 is a digital pressure, humidity and temperature sensor. This module consists of extremely compact metal-lid LGA packages. This module provides individually high linearity, high accuracy sensors for humidity, temperature, and pressure in an 8-pin metal-lid 2.5 x 2.5 x 0.93 mm³ LGA package. It is designed for low current consumption (3.6 μA), long term stability and high EMC robustness. This module is register and performance compatible with a Bosch Sensortec BMP280 digital pressure sensor. As it provides high performance in its applications like humidity and pressure measurement, due to this feature it used in emerging applications such as home automation, indoor navigation, health care, GPS and a low TCO. Its humidity sensing part provides a fast response time for fast context awareness applications and high accuracy over a wide temperature range. It pressure sensing part is absolute barometric pressure sensor having high accuracy, resolution and drastically lower noise than the Bosch Sensortec BMP280. Its temperature sensing part has been optimized for lowest noise and high resolution. This sensor is available in both I2C and SPI interfaces and it can be supplied with 1.71 to 3.6 V for sensor supply Vdd and 1.2 to 3.6 V for the interface supply Vddio. We can be triggered its measurements in regulars intervals. Whenever the sensor is disabled, current consumption drops to 0.1µA. It supports a full suite of operating mode which optimize the device for power consumption, filter performance, and resolution. Now, we discuss BME280 pinout. 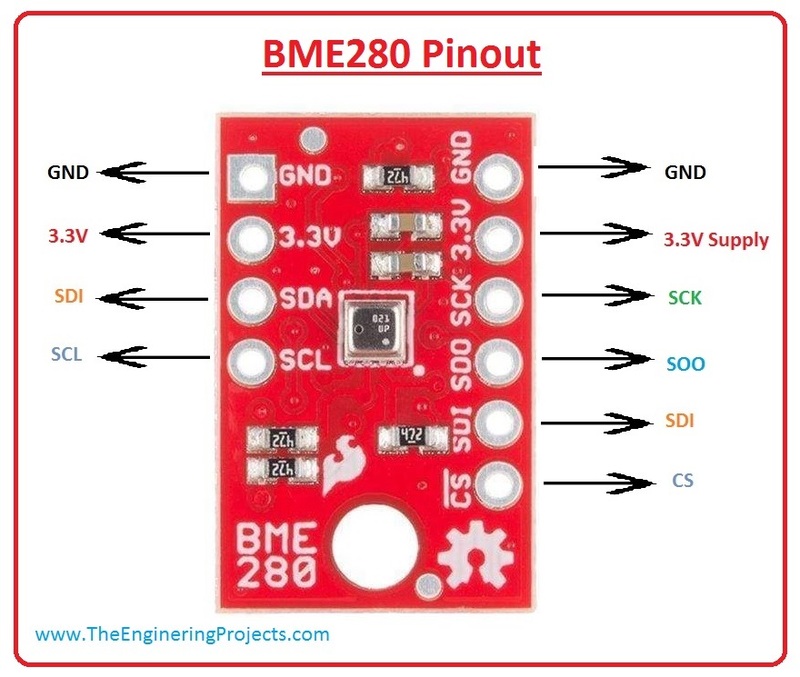 There is ten main pinout of BME280, which are described below with detail description. Pin#1 GND This pin is used for ground. Pin#2 3.3V At this pin, we supply voltage to the chip. Voltage should be regulated between 1.8 V and 3.6 V.
Pin#3 SDA This pin is used for I2C Serial data transmission (bi-directional). Pin#4 SCL This pin is used for I2C serial clock. Pin#5 GND This pin is used for ground. Pin#6 3.3V This is a supply voltage to the chip. Voltage should be regulated between 1.8 V and 3.6 V.
Pin#7 SCK This pin is used for clock line, 3.6 V max. Pin#8 SDO This pin is used for data coming out of the BME280. Pin#9 SDI This pin is for data going into the BME280, 3.6 V max. For better understanding let’s see the pinout diagram. Now, we discuss BME280 features. These are the feature of BME280, which are described below. It is available in metal lid LGA package with dimensions of 2.5x 2.5x 0.93 mm³. Its Interface protocol is I²C and SPI. It Supply Voltage is 1.71 to 3.6 V.
Its temperature range is -40 to +85°C. Its humidity range is 0-100% real. humidity. Its pressure range is 300-1100 hPa. Humidity sensor and pressure sensor can be independently enabled/disabled. This module is Register and performance compatible with Bosch Sensortec BMP280 digital pressure sensor. This module is RoHS compliant, halogen-free, MSL1. It gets more precise temperature, atmospheric pressure values, humidity, and approximate altitude data fast. It is Grove compatible and easy to use. It has a highly abstracted library for building projects quicker. In the next few lines, we are going to explain An Arduino Weather Station project with the BME280 sensor. We discuss which components are used in this project. An LCD shield for Arduino. Now we discuss this project assembling and working. 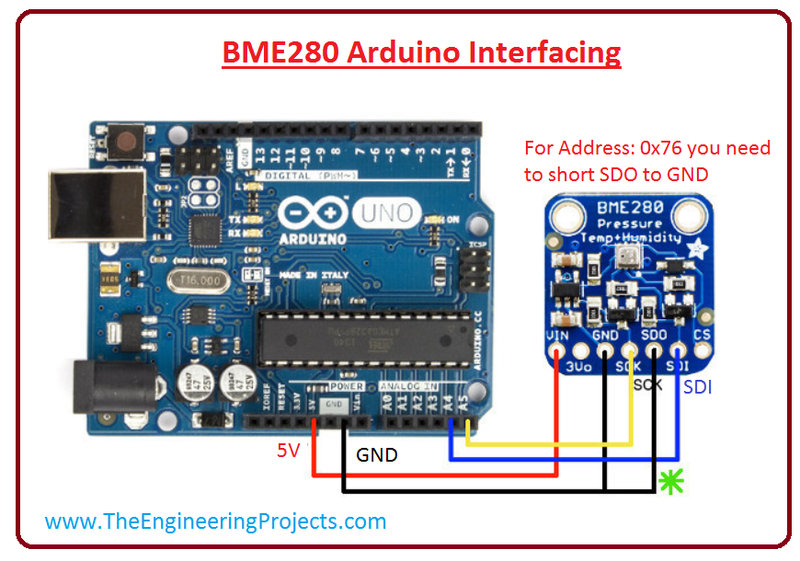 In this tutorial, we are using Arduino Mega but Arduino UNO can also be used. First, we connect LCD to Arduino. After this, we connect the Vin pin of a sensor with the Arduino 5v output pin. Next, we connect GND pin of a sensor to the SCL pin of Arduino and SDA pin of a sensor to the SDA pin of Arduino. That’s all connected, if we load the code and power up the project we can see the reading from the sensor on the screen. For better understanding lets see a diagram of this project. This module is Context awareness, due to this feature it is used for skin detection, room change detection. It is used for Health monitoring/well-being. It is used for Warning regarding dehydration or heat stroke. It is used for Measurement of lung volume and air flow. It is used in Home automation control. It is used for Control heating, ventilation, air conditioning (HVAC). It can be used for GPS enhancement (e.g. time-to-first-fix improvement, dead reckoning, slope detection). It is used for Indoor navigation (change of floor detection, elevator detection). It also tells Weather forecast. It is used for Vertical velocity indication (rise/sink speed).